1 Eating Disorders Outpatient and Inpatient Program, Child and Adolescent Psychiatry Division (PROTAD/SEPIA), Department of Psychiatry, Institute of Psychiatry, University of Sao Paulo (USP), São Paulo, SP, Brazil. 2 Clinical Psychology Program, Institute of Psychology, University of Sao Paulo (USP), São Paulo, SP, Brazil. Institution where the work was conducted: Clinical Psychology Program, Institute of Psychology, University of Sao Paulo (USP). Eating Disorders Outpatient and Inpatient Program, Child and Adolescent, Institute of Psychiatry, University of Sao Paulo (PROTAD-IPq-HC-FMUSP). Rua Dr. Ovídio Pires de Campos, 785. Zip: 05403-903 – Cerqueira César São Paulo, SP, Brazil. Background: Efficacy studies on the treatment of anorexia nervosa (AN) in childhood and adolescence are scarce and systematic reviews are almost non-existent. Objective: Systematic review of the literature regarding the modalities of psychological intervention based on evidence used in the treatment of AN in childhood and adolescence. Methods: The research was carried out in the databases: PubMed, PsycINFO and Cochrane, using the combined keywords: anorexia nervosa and evidence-based therapy. Articles published between 1990 and 2015 were assessed. Results: Of the 139 eligible articles, 14 were selected, of which 10 (71.4%) were conducted in the United States and England. The sample ranged from 9 to 167 participants. Randomized Clinical Trial represented the most frequent design (n = 9; 63.4%), with more than half of the interventions structured in 20 or more sessions (n = 9, 64.3%). Nine types of treatments were tested, with the most tested being Family-Based Treatment (FBT) (n = 7; 50%). Interventions involving the family seem to be more effective, however, the rates for complete remission are modest. Discussion: Although evidence of efficacy was verified in the treatments analyzed, the limited number of studies, the various methodological limitations and the methodological heterogeneity between studies make the findings inconclusive. Keywords: Anorexia nervosa, treatment, adolescence, systematic review, evidence-based psychotherapy. Anorexia nervosa (AN) is an eating disorder often initiated in adolescence, which causes severe disturbances to the eating behavior, resulting in damages that compromise the physical health and the psychosocial functioning of the individual1. Its diagnostic criteria are: restriction of caloric intake, which leads to a body mass index lower than the normal minimum expected in terms of age, gender, developmental trajectory and physical health; intense fear of gaining weight, resulting in persistent behavior aimed at weight and body shape control and disturbances in the manner in which weight or body shape is interpreted1. Despite the AN prevalence rate being relatively low, ranging from 0.3% to 1%2,3, the functional and physiological impairments associated with this condition are pervasive. In addition, the mortality rates due to malnutrition and suicide are the highest among all psychiatric disorders4-6. Whereby, early psychosocial interventions during adolescence are associated with a positive prognostic impact, by reducing damage and preventing chronic disease7-9. The use of proven effective treatments by the respective health care professionals, is therefore fundamental. However, due to the complex interaction of clinical and psychiatric problems, with emphasis on the ambivalent attitudes of patients and their families towards treatment8,10, there are significant obstacles that moderate the effectiveness of psychotherapeutic interventions and contribute to a limited number of studies in the area11,12. Some controlled studies suggest that family-based approaches produce more satisfactory results when compared to individual therapies, among adolescents with AN13-15. However, a systematic review with meta-analysis16 found that at the end of family-based treatment (FBT)15 no improvement was shown in comparison with the outcome of the individual intervention (Z = 1.62, p = 0.11). The same study pointed out that the family approach was significantly superior to that of the individual treatment at follow-up (Z = 2.94, p < 0.003). Another systematic review conducted in 2005 on the treatment of AN in childhood and adolescence only found five available randomized controlled trials (RCTs)11. The analysis of the results of these RCTs showed an intermediate or good outcome17 ranging from 47%18 to 90%19 among participants submitted to family-based treatment (adolescent and family members together) and between 18% and 90% for individual treatment or those involving adolescents and families, separately. Although there is scientific evidence regarding the efficacy of these interventions, the wide variation of the results makes the findings inconclusive. Despite there being a consensus that AN is associated with high morbidity and mortality rates4-6, especially when the onset occurs in childhood and adolescence, clinical trials on the subject in young people are scarce, and systematic reviews are almost non-existent. The purpose of this review is to describe the evidence-based psychological interventions in the literature for the treatment of AN in childhood and adolescence. The findings of this study may help specialists to use effective therapies in the treatment of their young AN patients. 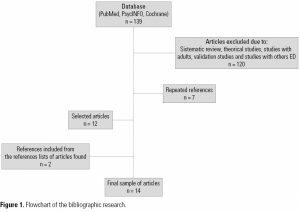 This is a systematic review of the literature, based on the recommendations described by PRISMA21. This bibliographic research was carried out in the second semester of 2016, in the databases PubMed, PsycINFO and Cochrane. The following search terms were used in combination: anorexia nervosa and evidence-based therapy. In PubMed, each of the search terms were placed, in a separate row on the Advanced Research tab, with the option Any Field selected along with “AND” being selected between the terms. In the article filter, under the Article Types option, the Randomized Controlled Trial option was selected. On the publication date tab, the period from 1990 to 2015 was selected. On the ages tab, the following ages were selected: Child: 6-12 years and Adolescent: 13-18 years. In PsycINFO, each of the search terms were placed, in a separate row on the Advanced Research tab, with the option Any Field selected along with “AND” being selected between the terms. In the article filter, under the Methodology tab, the following study designs were selected: Treatment Outcome/Clinical Trial. On the age tab, Adolescence (13-17 yrs) and School Age (6-12 yrs) were selected. In Cochrane the same criteria were used. The following inclusion criteria were established: articles published between 1990 and 2015; Evidence-based psychological treatment for children and adolescents with a mean age of less than 18 years, exclusive psychological treatment of Anorexia Nervosa (DSM-III, IV or V, depending on the time of publication), treated in outpatient or inpatient units. The following exclusion criteria were adopted: meta-analysis articles, systematic review studies, studies in which the aim involved the development of instruments for the assessment of signs and symptoms of eating disorders, studies involving pharmacological treatment or psychological treatment of other eating disorders. Bibliographical research was independently performed by two specialists in eating disorders, both with master’s degrees, based on the same procedure, to compare the results obtained by each other. In case of disagreement, a third master’s degree level researcher refereed in regards to the pertinence of being included in the study. The categories used to analyze the articles were: study nationality, year of publication, objectives, number of participants, mean age, theoretical perspective, number of intervention sessions, study design, instruments used to assess food symptoms and the family variables, end-of-treatment/follow-up results and methodological limitations. Figure 1. Flowchart of the bibliographic research. Of the 139 articles identified, 14 (10%) met the inclusion and exclusion criteria. Figure 1 shows the number of articles identified, selected and analyzed in each of the databases consulted. Table 1 describes the studies that tested the psychotherapeutic interventions for AN in childhood and adolescence. A greater predominance of studies in the United States (n = 7; 50%) and in England (n = 3; 21.4%) was observed. Only one article (7.1%) was published in Brazil22. No study was found in other Latin American countries. Nor were studies found that were conducted in Asia or Africa. Dividing the period of 1990 and 2015 in two (1990-2002 vs. 2003-2015) there is a concentration of publications between 2003 and 2015 (n = 10; 71.4%). Regarding the study design, four (28.5%) were open trial9,12,22,23; nine with RCT design18,20,24-30 and one (7.1%) had mixed design (open trial + RCT)31. The number of participants in each intervention ranged from nine22 to 16728 with a median of 43 and a mean of 63.7 (SD = 51.8). In all studies, the criterion for the diagnosis of AN was DSM-III, IV or V, depending on the time of the study. The age group selected in the studies ranged from 11 to 20 years, with mean age ranging from 13.9 years (SD = 2.1)29 to 18.45 (SD = 2.57)25. Female adolescents represented the majority in all studies. In general, three trends were verified in relation to the objectives of the studies analyzed: (1) to assess the efficacy of recent interventions in open or randomized clinical trials9,12,22,23; (2) to compare the efficacy of two different interventions previously tested24-26,29,30 and (3) to assess the effect of a previously tested intervention, in different doses or contexts such as the comparison of treatment efficacy in the short vs. long term or interventions in private clinics vs in the context of research27,28,32. In order to assess the symptoms of AN the Eating Disorder Examination (EDE), questionnaire or structured interview format, was the most used instrument (n = 8; 57.1%), followed by EDI, which was used in five studies (35.7%). For the assessment of the characteristics of family functioning, the instruments most used were: PARq, a self-reported questionnaire that assesses the quality of the bond between adolescents and their parents (n = 3; 21.5%) and FACES III, a self-completion scale that evaluates the level of cohesion and adaptability of the family (n = 2; 14.3%). A large number of other instruments for assessing family functioning were applied: famQ = Family Questionnaire; FSC = The Family Climate self-rating scale; FAD = Family Assessment Device. The following interventions were tested: Family-Based Treatment (FBT), Behavioral Family Therapy (BFST), Adolescent Focused Individual Therapy (ASF; former EOIT), Cognitive Behavior Therapy (CBT), Cognitive Behavior Therapy Enhanced (CBT-e), Systematic Family Therapy (SyFT), Cojoined Family Therapy (CFT), Separated Family Treatment (SFT) and Acceptance-based Separated Family Treatment (ASFT). An attempt was also made to combine two different modalities of psychotherapy (SFT+CFT)12, as well as an attempt to create a new psychotherapy protocol based on the principles of Acceptance and Commitment Therapy (ACT), a new modality of Cognitive-Behavioral Therapy9. The duration of the psychotherapy protocol varied from nine20 to 48 sessions. More than half of the interventions were structured with 20 or more sessions (64.3%). Certain studies had not predetermined the duration of the psychotherapy protocol. The only study that assessed the differences between short and long-term interventions attributed the first classification to the interventions with ten sessions and the second classification to those with 20 consultations. In this study, the researchers did not find differences between the groups in terms of BMI and dietary symptoms following treatment27. The research protocol most tested was FBT (n = 7; 50%). In general, the studies comparing the efficacy of the interventions did not find statistically significant differences between groups. Of the eight studies comparing the efficacy of interventions, only two (25%) found statistically significant differences between the groups compared26,30. In the first, the BFST was found to produce, at the end of treatment, results superior to the AFT (former EOIT) in terms of biological markers. In the second, it was found that, despite the comparison of the end of treatment for FBT vs. AFT not producing statistically significant differences, these differences were found in the follow-up period for the cases. Several methodological limitations were identified in the studies assessed: lack of description regarding the inclusion and exclusion criteria29,30, loss of a significant number of participants (> 25%) during treatment and follow-up9,24, lack of clarity regarding the remission criteria or remission assessed exclusively on the basis of biological markers12,25,29-31, difficulty in randomizing baseline participants26,31, presence of confounding variables, such as the need for hospitalization, the use of antidepressants for the treatment of comorbidities, which were not necessarily controlled in the analyses18,22,26,27,30,31 and non-probabilistic samples20,25,29,30. In only one study no methodological limitations were found28. The results indicated the lack of published research in the southern hemisphere, with the exception of Brazil and Australia. This is an important gap in evidence-based psychotherapies for the treatment of AN in childhood and adolescence, to the extent that sociocultural differences, especially in Latin American countries33, such as stronger and more lasting family ties with the family of origin, parenting styles and socio-educational skills may influence patient adherence to treatment and the efficacy of the intervention. The concentration of articles published in the last decade was verified, which indicates that, although in an incipient manner, studies in the field of ED in childhood and adolescence have recently emerged. In the present review 9 RCTs were found, a number higher than that found in a systematic review conducted for AN treatment in childhood and adolescence, published in 2005, which found only five studies with this design11. Although the RCT design is considered to be the gold standard for evaluating the efficacy of treatments, among the studies analyzed, several methodological limitations have decreased the quality of the scientific evidence produced. A large variation in sample size was observed, and most of the studies used non-probabilistic samples, possibly justified by the difficulties inherent in the treatment of AN34 and by the low prevalence compared to other psychiatric disorders, such as major depression and anxiety disorders1; In addition to the negation of the disease, avoidance of treatment and the patients’ ambivalence towards the desire to improve, since recovery involves weight gain10. All these factors imply low adherence to treatment and a high number of participants being lost after treatment and during follow-up. Girls represented the vast majority in all studies analyzed. However, recent research points to an increase in the number of boys with AN35-37, which indicates the need to assess their particularities in terms of clinical presentation, history of being overweight, impact of culture and media on eating behavior, as well as gender and sexuality. These variables have been addressed in qualitative studies38 and in case studies35, however, to date, there are few clinical trials with samples of children with AN. In this sense, samples composed by boys are recommended for future studies in order to explore their peculiarities and assess the response to treatment, for the purpose of increasing the efficacy of the services offered to this population. With the exception of the ASF26,29,30, with its psychodynamic approach, and the SyFT24 with its systemic approach, all other studies (n = 10; 71.5%) are based on the principles of Cognitive, Behavioral or Cognitive-Behavioral Therapies (FBT was included in the cognitive-behavioral therapies group because it has the same basic principles in regards to how the selection, maintenance and management of AN is performed). In Psychodynamic Therapy26,29,30 it is the patients with AN were considered to present egoic fragilities associated with difficulty with situations of uncontrollability, alexithymia and intolerance to emotional discomfort, in addition to difficulties with individuation and transitioning from childhood to adulthood. They use the eating control and food restriction, whether consciously or unconsciously, to reduce the contact with negative affections. The food restriction may also serve as a way of communicating through the body, unconscious affects that could not be transmitted via language. The objective of this modality of psychotherapy is to strengthen the adolescent’s egoic functions, develop tolerance to negative affects, including partial uncontrollability and the risks associated with adulthood, while training the ability to recognize and communicate positive and negative emotions. At the beginning of the psychotherapy process, behavioral goals are established for reducing food restriction and increasing weight, while these objectives are worked on in parallel with those described previously. In the studies assessed26,29,30 the psychodynamic psychotherapy protocol was offered during 32 sessions, 24 of which were made available to the adolescent individually and eight sessions were given to the parents, without the presence of the adolescent, with the objective being to assess the parental egoic functions, approach to parental behaviors that could assist in the process of changing the their child and to update the parents regarding the progress and difficulties of the psychotherapy process. In Systemic Psychotherapy, AN is considered to be the expression or attempt to solve a family problem rather than an individual one. The therapist assesses the patterns of family beliefs and behaviors, as well as the individuals’ communication skills. The objective of this modality of psychotherapy is to produce a new family functioning in which there is no need for one of its members to be chronically ill. There is no specific focus on decreasing behaviors such as food restriction or weight recovery goals. However, when the family spontaneously brings these aspects up, they must be addressed by the psychotherapist. In the systemic psychotherapy all 16 sessions are performed with the parents and the adolescent with AN together. Siblings or other people who live in the house are invited to participate in the psychotherapy sessions. The presence of all the members allows the clinician to assess the interaction pattern in the therapeutic setting, which is considered to be a sample of the family’s daily functioning. The Cognitive-Behavioral Therapies, although differing in terms of the setting (for example, number of sessions with the adolescent and parents, content covered, session time), have the following aspects in common: (1) psychoeducation about cognitive and behavioral changes associated with AN and training on the recognition and management of these changes by the parents and adolescents; (2) they consider that the adolescent is momentarily unable to choose how he/she will eat, since his/her judgment about the quantity and quality of food is altered and (3) their main objective is to reduce parents’ guilt for having a child with AN and their empowerment as protagonists in the feedback process. Based on these premises, several behaviors/techniques are trained for providing feedback to the child and how to react consistently in case of refusal, excess anger or attempts to circumvent the treatment. After regaining weight, the focus is on its maintenance. When the adolescent reaches a BMI that poses no risk to his or her life, issues relating to adolescence such as autonomy and new challenges, as well as issues regarding family dynamics are addressed. None of the psychotherapy protocols described assessed the efficacy of the treatment group. A significant number of assessment instruments were used to assess the behavioral profile of the patients, their parents and the ED symptoms. An even greater diversity was used to assess family functioning and family characteristics, such as perceived family support, level of autonomy, and degree of differentiation among the members. The wide variety of instruments used to assess the same family variables makes it difficult to compare the studies. In this sense, an attempt to standardize the instruments used in different research sites can be a promising measure; which would allow, in addition to the comparison between results from different samples, the development of meta-analyses. Most studies did not find a statistically significant difference when comparing the different treatment modalities18,20,25,29,30. This can be justified by the reduced sample size of most of the studies, resulting in a possible type II error (not finding differences between groups when they exist). The two studies26,30 that found significant differences between groups, compared individual treatment, focusing on the adolescent vs treatment of the adolescent and the family members. It was found that the second modality was more promising, which suggests that interventions that include the family in the treatment have a greater reach than those only involving the adolescent. This finding is corroborated by previous studies13,14,27. Apparently, in terms of cost-benefit ratio, FBT is superior to the other treatment modalities, as it is associated with faster regaining of weight and, therefore, less days of hospitalization. Even in FBT, the complete remission rates are not encouraging. This finding points to the need to develop and assess the efficacy of new modalities of research protocols in psychotherapy that integrate FBT interventions with the approach for AN maintaining factors associated with family dynamics, which are already established in the literature. The combining of good and intermediate outcomes without the presentation of the gross numbers was found, along with the creation of alternative remission criteria, and the presentation of only the participants who finished the treatment, rather than presenting the drop-out percentage; thus making it difficult to compare the results between the studies assessed. It is noteworthy that the study with the largest sample size and methodological rigor28 found some of the lowest complete remission rates among those reported: 18.2% in non-specialized health care, 15% in a specialized outpatient clinic and 21% in an inpatient unit. Interventions with non-probabilistic samples may possibly produce a type II error. This occurred in the great majority of the studies analyzed, and therefore, the findings should be assessed with caution. In this sense, multi-site studies are recommended, in which standardized psychotherapy protocols are used, which can be assessed in multi-site studies, increasing the sample-size and the statistical power of the data. The lack of clarity regarding the remission criteria makes it difficult to compare the results and the remission assessed exclusively on the basis of biological markers impoverishes the analysis, since it does not consider cognitive and behavioral variables. It was observed that studies that included only biological indicators, such as BMI and menstruation, had more favorable results, with a complete remission of 50% and 60% of the patients who started treatment. Studies that included psychopathological indicators, such as treatment outcome presented less favorable results, reaching 25%, as in the study by Agras et al.24. Based on this finding, it is verified that the challenge of providing feedback to the patients with AN is met with less difficulty than the approach for the respective psychological components. Disregarding the psychological components associated with AN as a primary outcome partially explains the modest rates for complete remission and the high rates of relapse found in this population39,40. Based on the results of this systematic review it was possible to outline the evidence-based studies for the psychotherapeutic treatment of AN in childhood and adolescence. 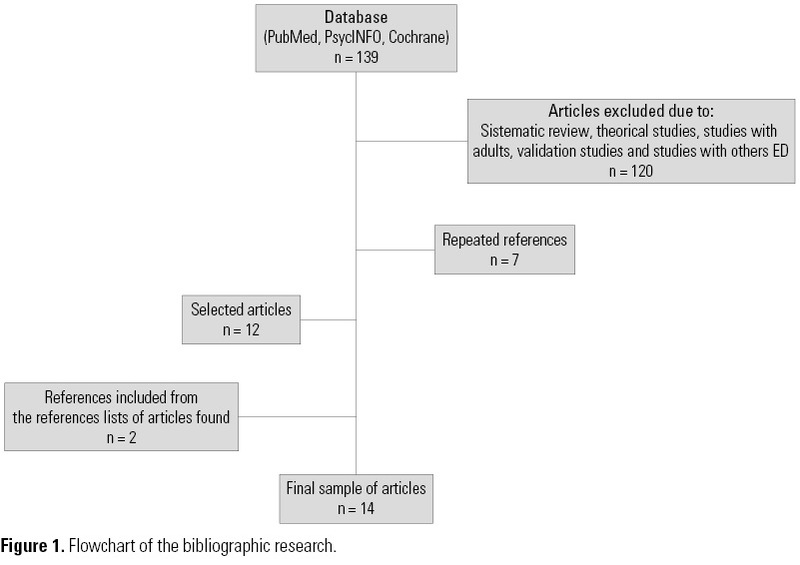 Although the review did meet its objective, it is necessary to list certain limitations that moderate the quality of the scientific evidence produced; whereby the qualitative methodology used in the data extraction reduces the strength of the analyses, since the results were not submitted to inferential statistical analysis. Another possible limitation is related to the wide variety of objectives, treatments, outcomes, instruments in the assessed studies, a characteristic that hinders the conclusions, but which, on the other hand, points to the need for methodological standardization of the clinical trials in the area so that the studies may be compared. It has been found that the efficacy of evidence-based treatments available for AN in childhood and adolescence is modest. Psychological interventions involving the family seem to have presented better prognoses when compared to interventions aimed exclusively at the children and adolescents. FBT is the most tested psychotherapy protocol, and in comparison with the others, it seems to be the most appropriate modality of treatment for the child-adolescent population. However, given the limited number of studies and various methodological limitations found, it is not possible to make a conclusion on the efficacy of the interventions. This aspect, as already identified in a previous review11, remains stable and constitutes an important limitation in the field of ED in childhood and adolescence. Even in the FBT, the treatment modality that appears to present the best evidence on efficacy, the results are only modest, with positive outcomes in approximately half the cases. Thus, there is a need to improve the content of existing psychotherapy protocols, both in the treatment of parents and adolescents, in individual sessions, in an effort to include the topics described in the literature as being crucial in the approach for patients with AN and their families. Psychological inflexibility and deficits in social-emotional skills have been repeatedly observed in adolescents with AN and their parents. Along the same lines, inappropriate parenting styles and practices have been reported among the parents of these adolescents. However, to date, these variables have seldomly been investigated in clinical trials for this population. Since these deficits are considered to be risk factors for AN selection and maintenance, studies that include training in social-emotional skills, adolescent psychological flexibility and the training of appropriate parenting styles and practices are necessary. All the clinical trials selected in this review were exclusively for girls or samples composed mostly of girls. Since the prevalence of boys with AN has increased42, studies to assess the clinical presentation and the respective response to treatment of these patients are important. Finally, certain methodological precautions are recommended in the development of clinical trials aimed at assessing the efficacy of psychological treatments for AN in childhood and adolescence, such as the standardization of the instruments used for assessing the outcome of AN symptoms and family functioning; the standardization of the remission criteria, which should be based on both physiological indicators and cognitive symptoms and a clear description of the criteria for inclusion and exclusion of participants. Multicenter studies are recommended to produce trials with probabilistic samples in order to increase the internal validity of the studies. This study was carried out with financial support from Capes, case number 33002010039D4, made available as a scholarship at the doctoral level, to the first author. The authors have no conflict of interest related to the topic of this article. The funding agency had no role in the study design or in the decision to submit the paper for publication. American Psychiatric Association (APA). Manual Diagnóstico e Estatístico de Transtornos Mentais (DSM-5). Porto Alegre: Artmed; 2013. Swanson SA, Crow SJ, Le Grange D, Swendsen J, Merikangas KR. Prevalence and correlates of eating disorders in adolescents. Results from the national comorbidity survey replication adolescent supplement. Arch Gen Psychiatry. 2011;68(7):714-23. Jaite C, Hoffmann F, Glaeske G, Bachmann CJ. Prevalence, comorbidities and outpatient treatment of anorexia and bulimia nervosa in German children and adolescents. Eat Weight Disord. 2013;18(2):157-65. Arcelus J, Mitchell AJ, Wales J, Nielsen S. Mortality rates in patients with anorexia nervosa and other eating disorders. A meta-analysis of 36 studies. Arch Gen Psychiatry. 2011;68(7):724-31. Franko DL, Keshaviah A, Eddy KT, Krishna M, Davis MC, Keel PK, et al. A longitudinal investigation of mortality in anorexia nervosa and bulimia nervosa. Am J Psychiatry. 2013;170(8):917-25. Button EJ, Chadalavada B, Palmer RL. Mortality and predictors of death in a cohort of patients presenting to an eating disorders service. Int J Eat Disord. 2010;43(5):387-92. Lock J. Evaluation of family treatment models for eating disorders. Curr Opin Psychiatry. 2011;24(4):274-9. Lock J, Le Grange D. Treatment manual for anorexia nervosa: a family-based approach. New York: The Guilford Press; 2015. Timko CA, Zucker NL, Herbert JD, Rodriguez D, Merwin RM. An open trial of Acceptance-based Separated Family Treatment (ASFT) for adolescents with anorexia nervosa. Behav Res Ther. 2015;69:63-74. Medeiros GC, Sampaio DG, Corchs F. Anorexia nervosa, paternalism and clinical practice. Arch Clin Psychiatry. 2014;41(5). le Grange D, Lock J. The dearth of psychological treatment studies for anorexia nervosa. Int J Eat Disord. 2005;37(2):79-91. Paulson-Karlsson G, Engström I, Nevonen L. A pilot study of a family-based treatment for adolescent anorexia nervosa: 18- and 36-month follow-ups. Eat Disord. 2009;17(1):72-88. Fisher CA, Hetrick SE, Rushford N. Family therapy for anorexia nervosa. Cochrane Database Syst Rev. 2010;(4):CD004780. Hay P. A systematic review of evidence for psychological treatments in eating disorders: 2005-2012. Int J Eat Disord. 2013;46(5):462-9. Lock J. An Update on evidence-based psychosocial treatments for eating disorders in children and adolescents. J Clin Child Adolesc Psychol. 2015;44(5):707-21. Couturier J, Kimber M, Szatmari P. Efficacy of family-based treatment for adolescents with eating disorders: a systematic review and meta-analysis. Int J Eat Disord. 2013;46(1):3-11. Morgan HG, Hayward AE. Clinical assessment of anorexia nervosa. The Morgan-Russell outcome assessment schedule. Br J Psychiatry. 1988;152:367-71. Eisler I, Dare C, Hodes M, Russell G, Dodge E, Le Grange D. Family therapy for adolescent anorexia nervosa: the results of a controlled comparison of two family interventions. J Child Psychol Psychiatry. 2000;41(6):727-36. Russell GF, Szmukler GI, Dare C, Eisler I. An evaluation of family therapy in anorexia nervosa and bulimia nervosa. Arch Gen Psychiatry. 1987;44(12):1047-56. Le Grange D, Eisler I, Dare C, Russell GFM. Evaluation of family treatments in adolescent anorexia nervosa: a pilot study. Int J Eat Disord. 1992;12(4):347-57. Turkiewicz G, Pinzon V, Lock J, Fleitlich-Bilyk B. Feasibility, acceptability, and effectiveness of family-based treatment for adolescent anorexia nervosa: an observational study conducted in Brazil. Rev Bras Psiquiatr. 2010;32(2):169-72. Dalle Grave R, Calugi S, Doll HA, Fairburn CG. Enhanced cognitive behaviour therapy for adolescents with anorexia nervosa: an alternative to family therapy? Behav Res Ther. 2013;51(1):R9-R12. Agras WS, Lock J, Brandt H, Bryson SW, Dodge E, Halmi KA, et al. Comparison of 2 family therapies for adolescent anorexia nervosa: a randomized parallel trial. JAMA Psychiatry. 2014;71(11):1279-86. Ball J, Mitchell P. A randomized controlled study of cognitive behavior therapy and behavioral family therapy for anorexia nervosa patients. Eat Disord. 2004;12(4):303-14. Lock J, Le Grange D, Agras WS, Moye A, Bryson SW, Jo B. Randomized clinical trial comparing family-based treatment with adolescent-focused individual therapy for adolescents with anorexia nervosa. Arch Gen Psychiatry. 2010;67(10):1025-32. Lock J, Agras WS, Bryson S, Kraemer HC. A comparison of short- and long-term family therapy for adolescent anorexia nervosa. J Am Acad Child Adolesc Psychiatry. 2005;44(7):632-9. Gowers SG, Clark A, Roberts C, Griffiths A, Edwards V, Bryan C, et al. Clinical effectiveness of treatments for anorexia nervosa in adolescents: randomised controlled trial. Br J Psychiatry. 2007;191:427-35. Robin AL, Siegel PT, Koepke T, Moye AW, Tice S. Family therapy versus individual therapy for adolescent females with anorexia nervosa. J Dev Behav Pediatr. 1994;15(2):111-6. Robin AL, Siegel PT, Moye AW, Gilroy M, Dennis AB, Sikand A. A controlled comparison of family versus individual therapy for adolescents with anorexia nervosa. J Am Acad Child Adolesc Psychiatry. 1999;38(12):1482-9. Accurso EC, Fitzsimmons-Craft EE, Ciao AC, Le Grange D. From efficacy to effectiveness: comparing outcomes for youth with anorexia nervosa treated in research trials versus clinical care. Behav Res Ther. 2015;65:36-41. Ciao AC, Accurso EC, Fitzsimmons-Craft EE, Lock J, Le Grange D. Family functioning in two treatments for adolescent anorexia nervosa. Int J Eat Disord. 2015;48(1):81-90. Scott P. A família brasileira diante de transformações no cenário histórico global. Rev Anthropológicas. 2005;16(1):217-42. Watson HJ, Bulik CM. Update on the treatment of anorexia nervosa: review of clinical trials, practice guidelines and emerging interventions. Psychol Med. 2013;43(12):2477-500. Herzog DB, Dorer DJ, Keel PK, Selwyn SE, Ekeblad ER, Flores AT, et al. Recovery and relapse in anorexia and bulimia nervosa: a 7.5-year follow-up study. J Am Acad Child Adolesc Psychiatry. 1999;38(7):829-37. Keel PK, Dorer DJ, Franko DL, Jackson SC, Herzog DB. Postremission predictors of relapse in women with eating disorders. Am J Psychiatry. 2005;162(12):2263-8. Alckmin-Carvalho F, Cobelo AW, Melo MHS, Zeni R, Pinzon VD. Age and gender changes in children and adolescent patients of a Brazilian eating disorder program. Arch Clin Psychiatry. 2017.;4(2):33-4.